Supplementary material reads: "Gershon. City desk. Illus. Grounded ship freed. No. 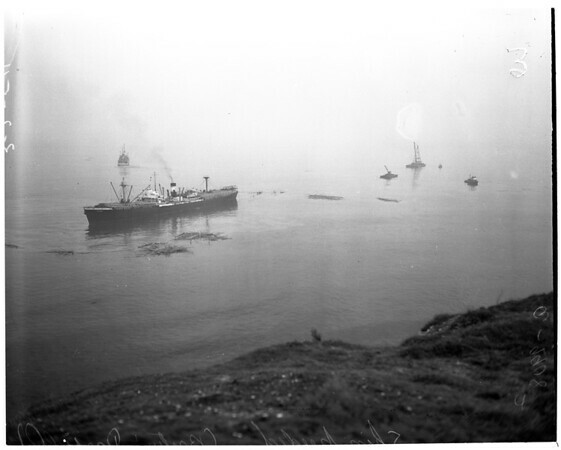 1: Just before high tide and combined efforts of the big derrick barge in the extreme right rear and tugs, the British Freighter Darfield is shown hard on rocks off Rocky Point. Note lumber floating around ship. Lumber was accidentally dropped in unloading part of her deck cargo to barges during Monday night. No. 2: 7 a.m. and ship has started to slowly make way sternward toward deep water. No. 3: 7:10 a.m. -- closer to freedom. No. 4: Off the rocks at least at 7:15 a.m. Tug in background is Navy's 'Gear' which towed Darfield to Los Angeles harbor anchorage for survey. No. 5-6: Tug Gear has freighter Darfield undertow 'stern to' en route to Los Angeles harbor. Ship was ground since 11:30 a.m. Sunday until 7:15 a.m. yesterday (Tuesday). 1954-03-02."